Quedlinburg is a town with medieval origins that has a large number of high quality timber-framed buildings. It is located in Saxony-Anhalt, part of the former GDR. the historic town within the city walls (an ‘old’ and ‘new’ town, originating from the 10th and 12th centuries respectively, and adorned with many fine buildings during an economic boom in the 16th and 17th century). the Westendorf district around the Burgberg (Castle Hill) with the collegiate church of St. Servatius (holding the graves of the first German Royal couple) and the buildings of the Imperial foundation. St. Wipert’s church with its crypt (dating from ca. 1000). the Münzenberg: the traditionally poor part of the town, with 60 small timber-framed buildings. 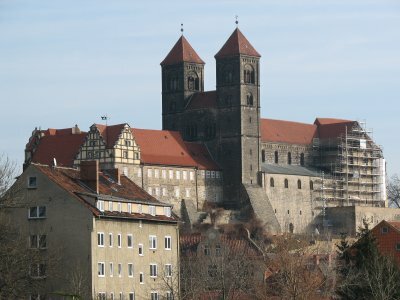 In its evaluation, ICOMOS praises the towns’ imperial origins (in 919, Quedlinburg became the first capital of the Saxonian-Ottonian dynasty of the Holy Roman Empire) over its timber-framed buildings. 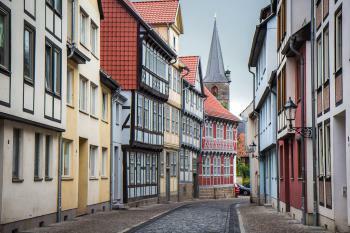 Quedlinburg is not far from Goslar, and at first sight has a lot in common with this neighbouring WHS (all those colourful buildings with timber-frames). I stayed here for two nights in Hotel Zum Bär. This very authentic and well recommended hotel is situated right in the heart of Quedlinburg’s medieval quarters. My room looked out on the medieval market square, a view that would make many non-Europeans plan a trip immediately. 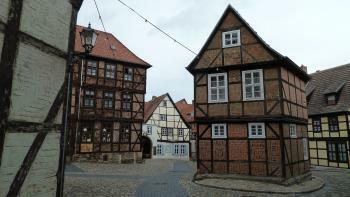 Probably the best asset of Quedlinburg is its highly original medieval town plan. It all started around the Burgberg, where the administrative center attracted merchants and craftsmen. After that, the old and new towns developed to hold more and more people. When the area inside the city walls became too crowded, new settlements were developed outside the walls. These historical developments can still be easily followed when you walk in Quedlinburg’s streets. 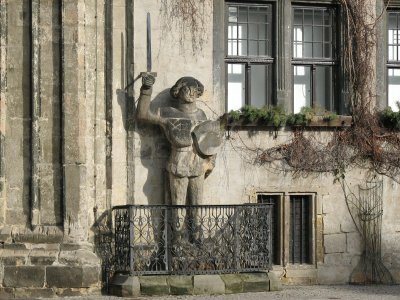 Like the WHS in Bremen, Quedlinburg also has a Roland statue to commemorate its medieval city rights. This one is standing in front of the Rathaus (City Hall) too, and is said to be the second smallest in Germany. The town is quite pleasant and has a number of things to see and do, however none of those really stand out. A half day visit was enough for me. Quedlinburg’s value as a tourist destination would benefit from some more signposting and explanation signs I think. But maybe we should be happy that this isn’t a museum town yet. It still has its rough edges in the form of crumbling buildings, cheap shops and eateries in monumental locations (a Chinese ‘bistro’ that sells döner kebab!) and very unsightly modern structures (for example the nursing home you encounter when walking up to the Burgberg). Love Quedlinburg. I find the city and all the old hoses best but outside is layers om buildings from 19th century and of course the magnificent and dramatic location of the cathedral and castle. Some strange buildings from GDR-zeit still make ugly wounds somewhere but I liked this WHS a lot. I didn't really have any expectations for Quedlinburg and so was extremely impressed when I finally saw the place. The old town has been preserved so well and the whole area feels like you are actually in a medieval town. The streets are full of beautiful old buildings and the layout (and even some of the shops) are straight out of the middle ages. Of course, the church at the top of the hill is a must visit but I didn't do too many other 'sights' here - I just enjoyed walking around and getting the atmosphere in the streets. A lot of the people who visit just come for the day (either on their own or in a tour group). I stayed the night and was really glad I did - the old town is much quieter in the evenings and you can see things and walk around without being amongst crowds of tourists. Also, if you're leaving by train (as I did), make sure you get a good look at the station - it's very cute! I visited this WHS in November 2014. I really loved this touristy town and the half-timber houses. I'd definitely want to return perhaps during a weekday when it might be less crowded. 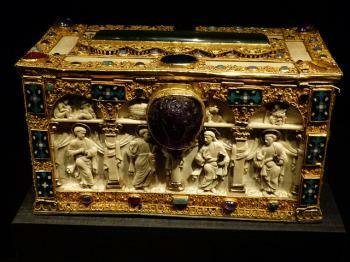 The highlight of my trip were the treasures inside the imposing Collegiate Church of St. Servatius (picture). Quedlinburg is one of the most historic towns in Germany and experienced its heyday in the 10th to 12th centuries. Walking through the cobble-stoned streets, admiring the countless historic buildings (with the largest collection of half-timbered houses in Germany), and exploring the many hidden corners is quite a pleasant experience. The main feature is the Schlossberg hill with the impressive Church of St. Servatius, where you can admire the Treasury and the interesting Crypt featuring the tombs of King Henry I. and Queen Mathilde. Other interesting buildings include the Renaissance-style Town Hall with the Roland statue in front, and the Romanesque church of St. Wiperti, a short walk away from the centre. Quedlinburg can be easily reached by train in a day trip from Berlin (a change in Magdeburg is usually required). During the day I thought Quedlinburg was rather nice. However an evening stroll started to reveal an even more charming side to the city. The winding streets of half timbered buildings were the real highlight for me, bringing back fond memories of Tallinn. There were lovely views from the Romanesque colligate church sitting on a hill in the centre of the city. My guidebook was glowing about its interior but I wouldn't say it was particularly remarkable, more just pleasant and simple inside. The castle area was really worthy of a slight climb and Hubert's recommendation for cheesecakes at Café Vincent is a suitable way to relax on the pleasant square next to the castle entrance. If, like me, you fly into Germany and rely on public transport; Quedlinburg is one of the tougher WHS to get to as it sits at the end of a remote branch line on Germany's wonderful train system. This rather out the way local added to its charm for me. There were a few tourists around but they were mostly domestic, and I feel my German improved immensely through my bumbling conversations over a doily laden breakfast of cold meats and cheese. I really liked Quedlinburg, it may not have the most astounding monuments however it is a rather fine urban ensemble, and being off the Anglophonic travel trail made this rather enjoyable for me. Quedlinburg is a small medieval town with the largest number of half-timbered houses in Germany. There are more than one thousand from six centuries. The town has a nice market square with the town hall and the Roland statue, the WHS includes also the Castle Hill with the Collegiate Church St Servatius, and several other churches. The Romanesque church of St Wiperti with its cemetery reminded me of one of these small enchanting churches in England. The charm of the town is more the preserved medieval townscape and not the extraordinary value of individual buildings. 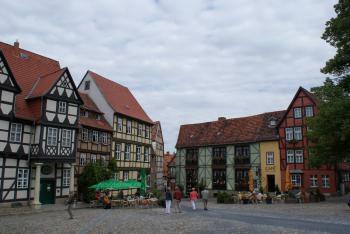 However, I liked Quedlinburg less than other medieval towns in Germany, such as the nearby Goslar or Bamberg. But I can not explain exactly why. My highlights in Quedlinburg are barely related with the WHS: the Lyonel Feininger Gallery and the Café Vincent, where you can taste about 30(!) different homemade cheesecakes. In August of 2002 I had the unique opportunity to visit Quedlinburg. Unlike other small cities in Western Germany Quedlinburg seemed relatively untouched by modern architecture and surroundings. Not a Mc Donald's in sight!!! It was truly a look at old Germany. 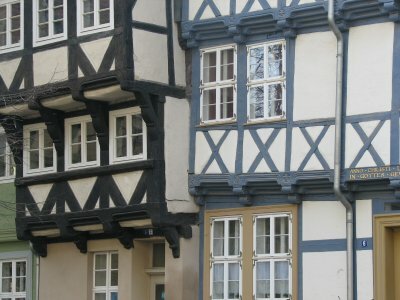 The half timbered houses in the center of the city were being restored by Polish artists brought into the area. Great care was given in noting the age of the buildings. Many structures dated back to the 17th century. The city has an abundance of churches and most of them were in the process of being restored and renovated. With only a few hours to visit I was only able to tour one of the churches. The grand pulpit set up at the top of a covered gilded staircase was certainly impressive. While still only partially restored (even after 12 years of re-unification) one could sense the grandeur that it once had. Tour books about the city were available in various languages. However german was the only spoken language. Not a word of english was heard anywhere which gave it a definite air of authenticity. German tour buses were just beginning to discover this city. A walk thru the center of the city will reveal secluded cobbled stoned courtyards... a definite fairytale experience. A trip to Quedlinburg would not be complete without a trip to the castle at the top of the hill. A restaurant at the top makes for a good stop. The view from the castle grounds gives a great panoramic view of the city with it's red clay tile roofs and many church spires. There is a church within the castle grounds. There however is an entrance fee to view the church. 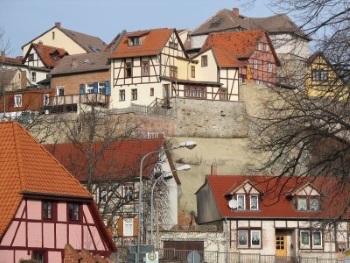 There are numerous small hotels and pensions in Quedlinburg. Some are inexpensive while others are quite pricey. Something for every price range I would imagine. This city along with the other cities in the region truly represent some hidden gems in the Harz mountains of northern Germany. I would recommend visiting this city if you want to take a trip "back into time". Enjoy!!! Inscribed area to be better defined and which? Art Nouveau: The town also has a number of interesting Art Nouveau buildings from the late 19th century.